The city’s historic Harbour House will throw open its doors this Friday, September 18, inviting visitors to find out more about local maritime history as part of Culture Night. The former Londonderry Port and Harbour Commissioners office was built in 1882 and played a key role in the management of Londonderry’s bustling port. The Mayor, Elisha McCallion, encouraged people to join in the celebration of local culture taking place across Ireland this Friday and to find out more about the city’s past. “Culture Night provides a great opportunity for people to get out and about and to visit new venues across the city,” she explained. “Harbour House is particularly special as it captures such an important era in Derry’s history, when the port played a key role in local commerce and the daily lives of people living here in the 19th and 20th centuries. Education Officer with Derry City and Strabane District Council’s Museum Service, Margaret Edwards, explained why the building is so significant. “With the expansion of the city’s port throughout the 1800’s it was established that an organised body was needed to oversee its growth and maintenance. “In 1854 the Londonderry Port and Harbour Commissioners was established to manage all matters related to shipping and the growth of the port. They radically upgraded the city’s port facilities to cope with the growth of passenger lines and trade shipping routes. Eventually Harbour Office, as it was known, was built and became the administrative hub for the port, and the Commissioners remained based here until they finally moved to Lisahally in 1993. The Council then purchased the building and it operated as a museum from 1995 - 2012 with an exhibition of artefacts in keeping with the Victorian surrounds of the building. “The two storey structure which dominates Harbour Square is distinctively built from local dressed yellow sandstone, and is listed (Grade B) by the Historic Monuments and Buildings Branch DoE (NI). Harbour House is just one of a number of alternative venues which will play host to a wide variety of cultural experiences on Friday night. Continuing on the historic theme, guided tours of the Tower Museum will also be operating throughout the evening, with music by Tracey McRory, as well as tours of the Freemasons Hall and the Museum of Free Derry. Meanwhile the Yellow Yard will showcase an array of bug themed junk sculptures, while Ronnie Carnwath displays his exhibition of awful album covers in Connoisseurs of the Dreadful in the Abbazappa Record Shop. And children can also join in the celebrations throughout the evening with some Reading Adventures in the Verbal Arts Centre, and a Circus Worksop at In Your Space. 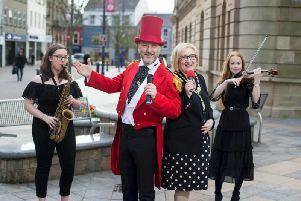 CultureTech will be in full swing with a packed programme of Teccie treats taking place throughout the city over the weekend including Maker City in the Craft Village and Foyleside and #Musicconnect in Cafe Soul and the Guildhall Square.